The International Association of Fairs and Expositions has one of the most eclectic and vibrant trade show floors of any industry conference. There is nothing like being towered over by a walking tree to get ideas flowing for fair programmers. From ticketers to liger (tiger and lion hybrids) breeders, attendees can discover everything they need to host a successful and entertaining fair. Amplify strolled through the rows of animated dinosaurs, magicians, and celebrity impersonators to bring you some of the convention’s most colorful acts. Check out six of the most unique performers IAFE had to offer below. I call it PG12-and-a-half. It’s not naughty. It is nothing I would embarrass a priest of a nun with, but I’m not naughty enough to work in pubs. I’m a family show and it goes over the heads of anyone 12 and under. Who are some performers that you look up to? There’s many that I consider my mentors and major influences in my life. Terry Stokes Sr. was without a doubt a major influence in my performance. My father did hypnosis and magic, so he was my mentor in every way that you can imagine when I started out. There are people who have passed away like Ormond McGill who wrote the encyclopedia on stage hypnosis. I purposely went to my clinical training at a school where he was part of the staff. My father passed away in 2008, but he was proud of me. He was glad that I could make a better living than he ever did. He was an artist. It takes three thrings to be star quality. One of them is god given talent, one of them is presentation and how you look when you walk on stage, and the third is marketing. If you have one of those things you’re an artist. If you have two of them, you’re a professional. You’ll make a living. 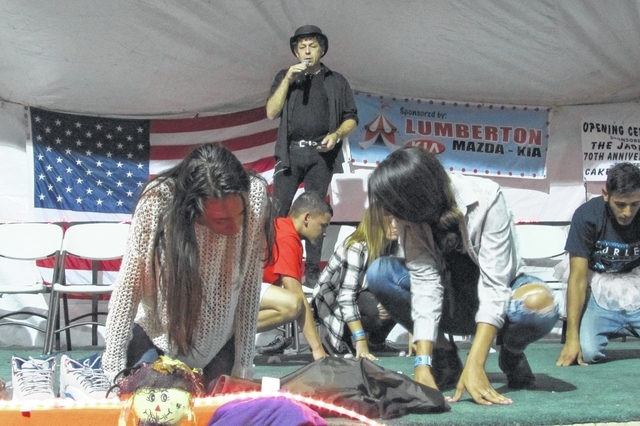 LUMBERTON – “It’s the last night of the fair” was the popular refrain from vendors, performers and ride workers Thursday night as Hurricane Matthew forced a premature end to the annual festivities. The official announcement came via the Robeson Regional Agricultural Fair’s Facebook page, stating that “due to impending hurricane” and citing safety concerns fair organizers closed down for 2016 at 11 p.m. Thursday. The impact of the storm was being felt already on Thursday evening. Dreary weather and the looming storm kept attendance numbers lower than previous evenings and several vendors’ booths were vacant. However, the wet threat of Matthew didn’t dampen the spirits of those who ventured out, especially those who lost their minds, or watched others losing theirs. They came to the fair, got on stage, got sleepy, and woke up about an hour later. They woke up with no knowledge that they’d been twerking, hopping as a bullfrog, admitting secrets, or witnessing their parents wearing wildly inappropriate clothing. They had no knowledge because it had all been in their heads — hypnotic suggestions from veteran magician and comedy hypnotist Alan “The Sandman” Sands. 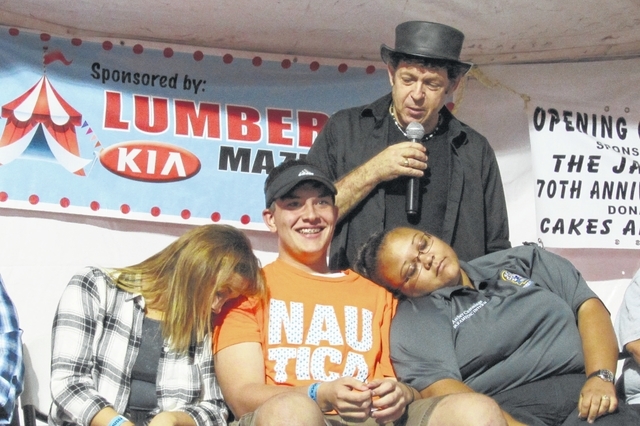 Comedy hypnotist Alan Sands gives Trevor Cox, center, the power to make others fall asleep during his show, Thursday night. Hypnotized show participants try to lay an egg on stage Thursday. Hypnotized by Alan Sands, show participants hop like bull frogs trying to catch flies. 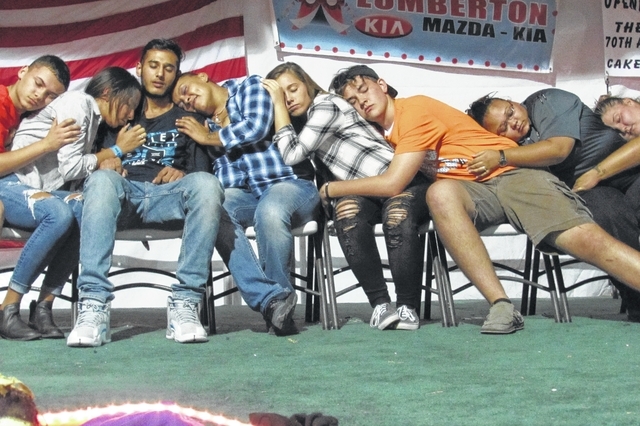 Participants in Alan Sands’ hypnotism show are fast asleep. Hypnotized, show participants huddle together for warmth in the imagined freezing cold. Sands has been performing at the Robeson County Agricultural Fair for 15 years and has been a comedy hypnotist for 29 years. The son of a magician, performing in his blood. The show pulls willing participants on stage, many keen to feel what it is like to be hypnotized. After they are put under the psychological spell, Sands’ subjects do and feel everything he says, much to the amusement of the audience. Trevor Cox, 18, was very keen to get on stage for the 9 p.m. show Thursday. Afterwards, he remembered his eyes rolling back in his head as Sands put him under, but nothing from then on. Strange for the young man who woke up wearing a purple tutu and sporting toenails painted orange. “Luckily (orange) is my favorite color,” Cox said. Amanda Cameron has no memory either. Cameron left the stage with a bra full of what she was told were $100 bills she had to hide. In reality, they were tissues. “I nearly peed my pants,” said Kathleen Wills, who watched from the audience as a friend thinking she was Kermit the Frog ran through the crowd looking for her Miss Piggy. Gloria Cox of Lumberton was eager to come back and see the show Thursday evening. She’d been a part of it the night before and reveled in a little schadenfreude, as she still had no knowledge of what she’d been subjected to on stage. It’s the second straight year the fair has lost significant days to the weather. It was to extend through Saturday. “The weather just isn’t cooperating with us this year, it’s sad,” said Coble Wilson, president emeritus of the fair board.